Sun Yat-sen Park is situated on the western side of Tian'anmen. Since the Ming Dynasty this had been where emperors prayed for the gods of land and crops. This is why it was known as Altar of Land and Grains. In 1914 it was converted into the Central Park, and in 1928 it was renamed to in memory of Sun Yat-sen.
Main buildings include the Altar of Land and Grains and the Hall of Worship and its ancillary structures. 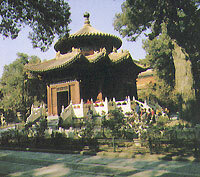 New structures have been added to beautify the place, such as the Pavilion of Pine and Cypress Verdure, Pavilion for Throwing Arrows into the Pot and the Rain Pavilion in the eastern part; and the Sunlight-Welcoming Pavilion, Waterside Pavilion, House of Year-Round Delight and the Botanical Garden in .the western part. The Sun Yat-sen Park is known for its ancient cypress trees, and surrounding the park are more than 1,000 trees that have been growing there for centuries. The Altar of Land and Grains, the architectural centerpiece of the entire park, sits in the middle of the park's axial line. The altar is square in shape and built of white marble. Built in 1421, or the 19th year of the Yongle Reign of the Ming Dynasty, it was where Ming and Qing emperors offered libation and sacrifices to the God of Land and the God of Grains for blessings of bumper harvests.